Researchers, developers, and our own publishing and product teams gathered to help define the computationally reproducible research article of tomorrow. 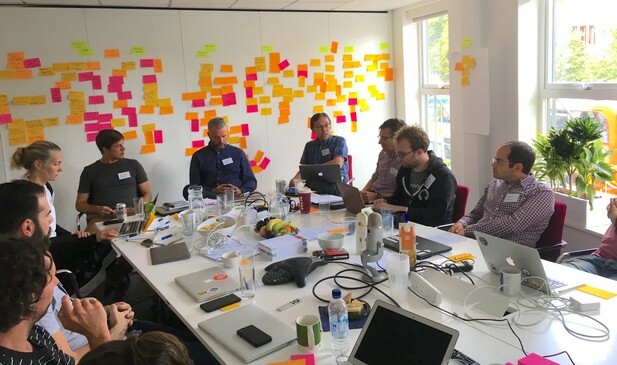 On Monday, June 26, researchers, technology developers and members of the eLife executive team gathered to discuss how data and code could be more closely integrated with the scientific article. Over the course of the day, we developed a framework of ideal requirements, questions and challenges for a practical end-to-end implementation of computationally reproducible research documents, or ‘executable articles’, from authorship to publication. The workshop addressed a topic we have been exploring recently: how to package up all the workings behind a research article in a way that allows the author to present a more complete narrative and the reader to replicate and build on this work. With computational analyses becoming a more prevalent methodology within several areas of research in the life sciences, including genomics and neuroscience, we would like to support authors who want to share their code and data in a more reusable manner. Today, many researchers author their research in whole or in part in R Markdown, or compile it in Jupyter Notebooks. These are rich, code-friendly environments allowing both textual narrative and executable code to coexist in one document. However, come publication time, these code-and-data-rich documents are re-worked into static PDF’s, or full-text HTML, thus losing the important link between narrative and algorithm. One means to preserve that link and to reward those who document and share their research in this way, may be via the creation of a new type of research artefact: the executable article. To explore how this idea could become a reality, we gathered a group of developers, researchers, and publishing experts for a day. We were pleased to be joined by developers from Project Jupyter, Substance and Stencila, as well as researchers from the University of Cambridge and the University of Manchester. The participants worked closely with eLife Editorial, Production, Product and Communications staff, to map out workflows and flesh out ideas as we addressed the requirements of an executable article as it would pass from authoring, through submission, peer review, production, publication, and to post-publication reuse. Image courtesy of Michael Aufreiter. The participants were Michael Aufreiter (Substance), Nokome Bentley (Stencila), Oliver Buchtala (Substance), Steven Burgess (Editorial Community Manager, eLife), Matthias Bussonier (Project Jupyter and Berkeley Institute for Data Science), Andy Collings (Executive Editor, eLife), Nick Duffield (User Experience Designer, eLife), Stephen Eglen (University of Cambridge), Melissa Harrison (Head of Production, eLife), Thomas Kluyver (Project Jupyter and University of Southampton), Giuliano Maciocci (Head of Product, eLife), David Mawdsley (University of Manchester), and Naomi Penfold (Innovation Officer, eLife). This workshop followed a recent broader call for input via a survey on reproducible research tools, the results of which will be shared online in due course. The event highlighted a number of specific challenges spanning the authoring-to-publication workflow, and stressed the need for new publication practices and technical infrastructure to cater for code-rich manuscripts and the preservation of their future ability to execute. If you are interested in future opportunities to be involved with this project, please email Naomi on innovation@elifesciences.org. Alternatively, for the latest in innovation, eLife Labs and new open-source tools, sign up for our technology and innovation newsletter. You can also follow @eLifeInnovation on Twitter.